A patient's confidence in his or her ability to plan for and participate in a colorectal screening is important. Self-efficacy, a patient’s confidence that they can plan, schedule, and properly participate in a colorectal screening is a key predictive factor of intent to undergo colorectal screening, a study published in the American Journal of Preventative Medicine has shown. “We all know that screening for colorectal cancer makes a difference, but we’re really failing to get people adequately screened for it,” said Mack T. Ruffin, MD, MPH, chair of family and community medicine, Penn State College of Medicine, and lead researcher. Researchers at Penn State College of Medicine; University of Michigan, Ann Arbor; and Michigan State University, investigated the factors that influence a person’s intent to undergo screening. The study consisted of 570 men and women from 15 primary care practices in Detroit between 2012 and 2014. There are 2 tests for colorectal cancer: colonoscopy and stool blood testing. 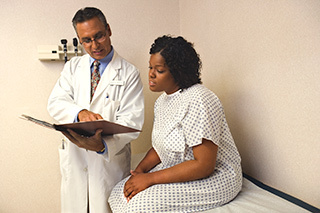 Both test involve patient planning and preparation outside a doctor’s office. Thus, a patient’s confidence in his or her ability to plan, schedule, and participate in a screening is important. African Americans had a higher intent to undergo screening then white Americans. A trend that is unique for colorectal cancer, Ruffin said. Additionally women had lower self-efficacy for colorectal screening than men due to a misconception that colon cancer is a disease specific to men. This study was part of a larger study on using a computerized decision aid. Researchers are currently working on a way to aid in the decision-making process for colorectal screening using an interactive tool.